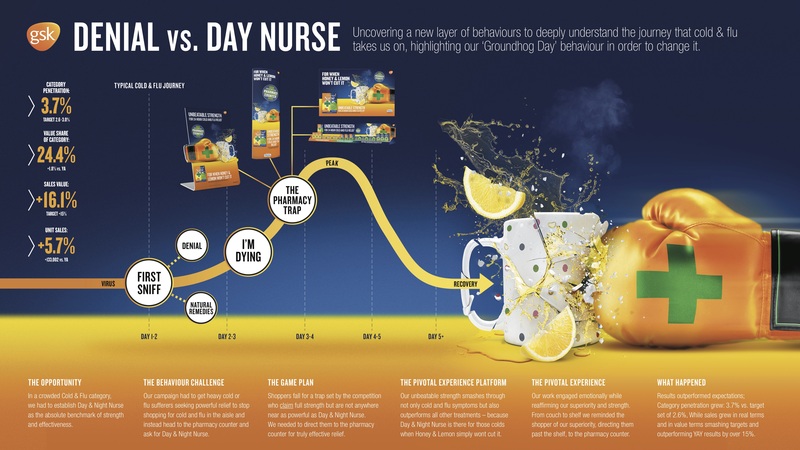 We uncovered a new layer of behaviours to deeply understand the journey that cold & flu takes us on, highlighting our 'Groundhog Day' behaviour in order to change it. Our ambition is to drive growth by innovating where and how people discover, buy and use your products and services. Our proven growth framework unlocks growth opportunities in consumer (need state), channel (mission) and category (demand space). Our creativity changes behaviour in the moments that matter. With expertise across Retail & Shopper; Omni-Channel & Digital Commerce; Experiential; Brand & Design; Innovation; and B2B & Trade, our promise is to deliver ideas that create growth for your brand. Our clients include: Coca-Cola, GSK, Kimberly-Clark, PwC, HSBC, GORE-TEX, Shell, Diageo and Unilever. We’re led by our values. We are brave, we are trusting, we are reinventive and we are human. The people who make up Geometry are Geometry and we work hard to look after them – whether it’s our award-winning wellness programme, our IPA Gold standard training, our industry-leading benefits or our funding programme for employees’ passion projects.